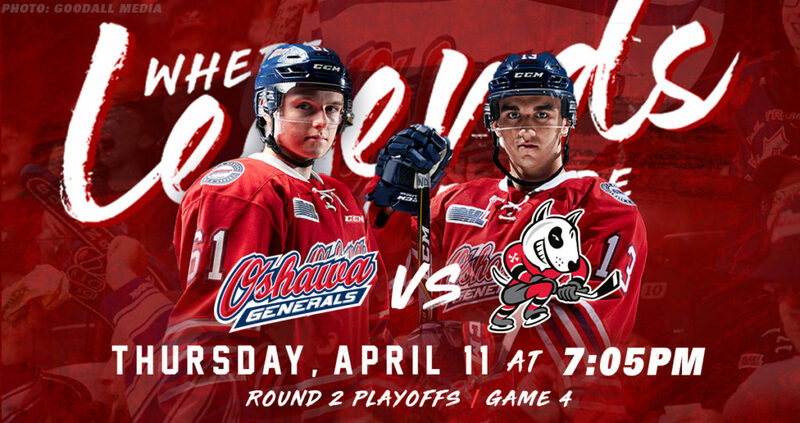 The Generals remain at home tonight to battle the Niagara IceDogs in Game 4 of the second round. After starting off the series by falling down 2-0 behind the IceDogs who claimed their two home games, Oshawa got right back into the series with a big 4-1 win at home in Game 3. Finishing off their back-to-back home contests with Game 4 tonight, the Gens aim to tie up the series with a win and head back to Niagara even at two wins a piece. Heading into tonight’s game with the series at 2-1 for the IceDogs, the Gens will look for a similar performance to Game 3 to tie up the series. After struggling early to find the back of the net in Niagara with 3 goals in Games 1 and 2, the Gens were able to find their rhythm in Game 3 as they potted 4 past the IceDogs. With the strong offense and solid defensive play shown in Game 3, the Gens enter tonight’s game with momentum as they’ll once again have the hometown crowd behind them. Continuing his stellar post-season so far in the second round has been Gens goaltender Kyle Keyser. The net minder started off Round Two by making an incredible 84 saves through Games 1 and 2 against the IceDogs to help keep the Gens in each game and give them a good chance. Following up those two excellent performances, Keyser recorded a 28-save win in Game 3 at home after only letting one goal past him. With Keyser on fire, the Gens have solid goaltending behind them as they look to continue to hold off the IceDogs at home. A couple of Generals players who had big performances in Game 3 include Serron Noel and Brandon Saigeon. Noel was on a tear Tuesday night as he potted the Gens first goal of the night and added another to come away with a 2-goal outing. Saigeon, the Gens leading point scorer so far in the playoffs, also had a strong night after recording 2 helpers to help drive the offense. Coming off a strong Game 3, look for each forward to enter tonight’s game hungry to score more. Head to the Tribute Communities Centre tonight for the 7:05pm puck drop to watch the Gens as they take to the ice for Game 4 against the IceDogs! 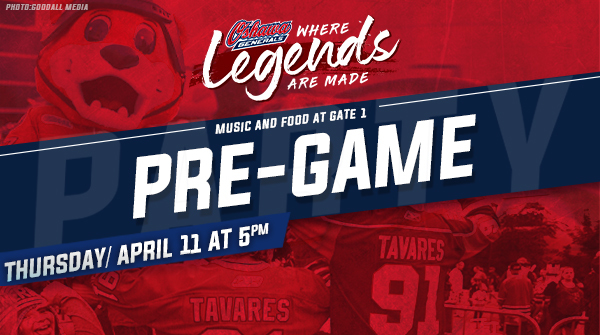 Also, join us before the game tonight for a pre-game tailgate party with music and food at Gate 1 starting at 5:00pm! After tonight’s game, the team will head back to Niagara for Game 5 on Saturday night before returning home for Game 6 on Monday if necessary.